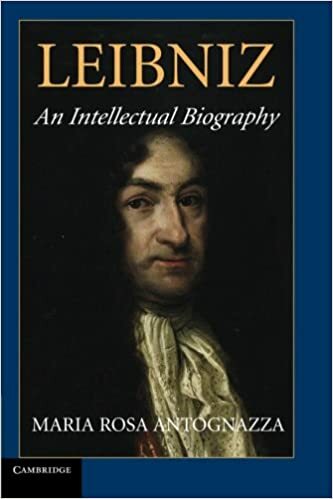 Of all the thinkers of the century of genius that inaugurated modern philosophy, none lived an intellectual life more rich and varied than Gottfried Wilhelm Leibniz (1646-1716). Trained as a jurist and employed as a counsellor, librarian, and historian, he made famous contributions to logic, mathematics, physics, and metaphysics, yet viewed his own aspirations as ultimately ethical and theological, and married these theoretical concerns with politics, diplomacy, and an equally broad range of practical reforms: juridical, economic, administrative, technological, medical, and ecclesiastical. Maria Rosa Antognazza's pioneering biography not only surveys the full breadth and depth of these theoretical interests and practical activities, it also weaves them together for the first time into a unified portrait of this unique thinker and the world from which he came. At the centre of the huge range of Leibniz's apparently miscellaneous endeavours, Antognazza reveals a single master project lending unity to his extraordinarily multifaceted life's work. Throughout the vicissitudes of his long life, Leibniz tenaciously pursued the dream of a systematic reform and advancement of all the sciences, to be undertaken as a collaborative enterprise supported by an enlightened ruler; these theoretical pursuits were in turn ultimately grounded in a practical goal: the improvement of the human condition and thereby the celebration of the glory of God in His creation. As well as tracing the threads of continuity that bound these theoretical and practical activities to this all-embracing plan, this illuminating study also traces these threads back into the intellectual traditions of the Holy Roman Empire in which Leibniz lived and throughout the broader intellectual networks that linked him to patrons in countries as distant as Russia and to correspondents as far afield as China.